Several factors play a role in the involvement of different organs by PTLD, and involvement of specific organs by the disease is associated with different disease phenomena, lesion features and survival specificities. ,,, Moreover, involvement of some organs can predict simultaneous involvement of some other organs by the disease. Hence, identification of specific organs affected by PTLD is of enormous importance because this helps us to manage and treat the disease better. Additionally, we might even be able to design some preventive and screening measures that can potentially decrease the incidence of this disease or increase survival of the affected patients. Individual cases of localization of PTLD in the gastrointestinal (GI) tract have been reported in the literature. However, due to the limited number of cases with involvement of specific GI tract segments, there is scarcity of data on specific characteristics for disease affecting each GI tract section. Involvement of the stomach is rare in PTLD. 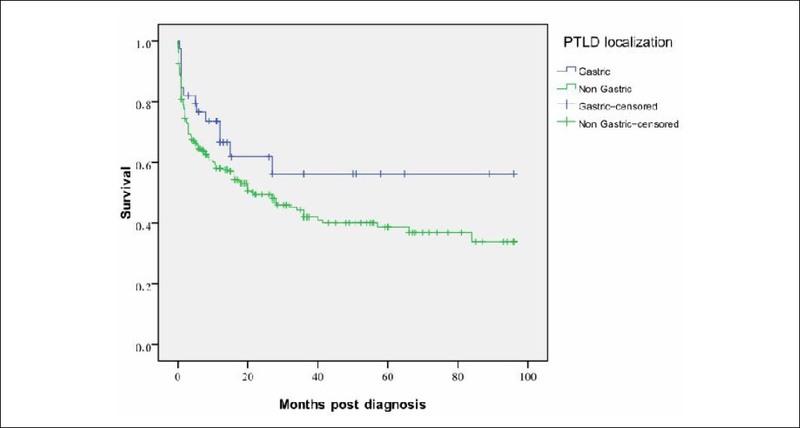 To the best of our knowledge, until now, gastric PTLD has not been previously evaluated in any transplant population. We therefore aimed to accumulate the existing data on individual reports of gastric PTLD in the current literature and to analyze and compare this data with data on PTLD in other sites, in order to see if there are any unique clinical and histopathological features, potential predictors and prognostic factors associated with PTLD involving the stomach. A comprehensive search was conducted for available data in the current literature using the Pubmed and Google scholar search engines for reports of lymphoproliferative disorders in the gastric tissue of renal transplant patients. Keywords used for this purpose were "lymphoproliferative disorders + transplantation + stomach localization," "lymphoproliferative disorders + transplantation + gastric localization," "PTLD + stomach involvement" and "PTLD + gastric involvement." When full articles were not available, e-mails were sent to the authors requesting for the same. Only reports in which data of each patient were presented separately were included in the analysis. To minimize selection bias, we included only studies reporting their series of patients from single or multi-center populations. Studies with any specific selection criteria were excluded from the analysis; lymphoproliferative disorders occurring within the stomach after transplantation were considered as our case group, and patients developing PTLD in the other sites were used as controls. A standard questionnaire was developed to collect data from different published studies. Finally, data from 36 previously published studies ,,,,,,,,,,,,,,,,,,,,,,,,,,,,,,,,,,, were included into the analysis [Table 1]. The duration between transplantation and onset of PTLD was defined as the period between performing the transplant surgery and appearance of first signs of PTLD or its diagnosis, based on the protocol of the studies. Table 1: The list of the reports included in the analysis. Overall, 472 recipients of organ grafts, who developed PTLD during their post-transplant period, were included in the analysis. Fifty-six patients (11.9%) had gastric PTLD while the remaining 415 patients (88.1%) had PTLD in other sites. The patients' status regarding EBV infection was documented in 202 patients (42.9%), of whom 146 (72.3%) were reported positive. Because data used for this study were from different studies and they did not have any unique common approaches, we were not able to get all the data needed from the included patients. Disseminated lymphoma was diagnosed when it was declared by the authors or at least three different organs were involved by PTLD (different lymph node areas were excluded from analysis due to lack of knowledge on how to categorize); this was reported in 93 patients (31.4%). Multi-organ involvement, defined as involvement of more than one unique organ as well as more than one lymphatic region, was documented in 201 patients (53.5%). At diagnosis of lymphoma, all patients were receiving or had received immunosuppressive regimens consisting of varying combinations of azathioprine, prednisone, cyclosporine, mycophenolate mofetil, anti-thymocyte/lymphocyte globulin (ATG/ALG) and OKT3. More or less, a rather uniform approach was used to manage the PTLD patients in the included reports. On diagnosis of PTLD, the first step in almost all reports was to decrease or discontinue immunosuppressive therapy; different regimens of chemotherapy, with or without surgical interventions, were also used for some patients. Response to treatment was defined when a favorable change was observed in the cancer measures as well as patients' clinical condition; data on response to treatment of the PTLD was available in 188 patients (39.8%), of whom 134 (71.3%) responded to anti-malignancy treatment. However, new criteria were laid down for defining remission rates in these patients; an episode of remission was said to occur when patients were alive after the 24 th month of diagnosis of PTLD. Absence of remission was defined when a patient died within the first month after diagnosis of PTLD. According to these criteria, 297 patients (62.9%) had remission, of whom 189 (63.4%) had at least one episode of response to treatment, irrespective of their future disease course. Death was reported in 183 of the reported cases (49.3%); death due to PTLD was defined when: (a) if authors stated it or (b) when the patient died within six months post-diagnosis of PTLD unless the authors stated other causes for death and (c) when patients died due to complications related to treatment of PTLD. Based on the above-mentioned criteria, 137 patients (74.9% of the total mortality rate) died due to the disease. SPSS v.13.0 was the software used for data analyses. Statistical differences between patient sub-groups were looked for by using  and Fishers' exact tests for proportions, and the Student's t test for continuous data. Survival analysis was calculated with life tables and Kaplan-Meier methods as well as the log-rank test. All statistical tests were performed at the 0.05 significance level. P-value below 0.1 was considered relevant. Overall, 472 patients with lymphoproliferative disorders after organ transplantation were entered into the analysis. There were 192 male (64%) and 108 female patients (36%, 172 unreported). The mean age at diagnosis of PTLD was 34.1 ± 21.1 years. The mean interval between transplantation and the diagnosis of PTLD was 49 ± 50.9 months and the mean duration of follow-up after diagnosis of PTLD was 22.3 ± 29.8 months. The characteristics of the patients regarding the site of malignancy are summarized in [Table 2]. The Chi square test showed that there was no difference between organ recipients with or without gastric PTLD regarding histopathological features, demographics, lymphoma cell types, immunosuppressive agents used, presentation time, multi-organ involvement, disseminated PTLD and EBV positive rate. Age at the time of transplantation and the interval between transplantation and development of PTLD were also comparable between the two groups. [Table 3] summarizes the involvement of different organs by PTLD, with or without concomitant involvement of the intestine. Gastric PTLD was not associated with simultaneous involvement of any other organ. Table 2: Characteristics of transplant recipients with post-transplant lymphoproliferative disorders of the stomach versus other localizations. 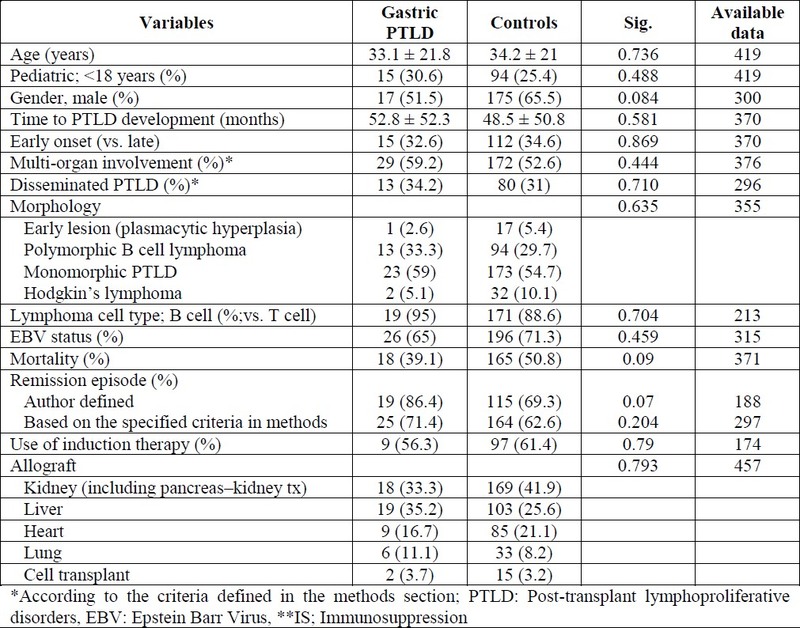 Table 3: Frequency of concomitantly involved organs in transplant patients with post-transplant lymphoproliferative disorders enrolled in this study. The survival rates of patients, with and without gastric PTLD, were compared. When death irrespective of the cause was used as the outcome, the log-rank test showed a trend toward a slightly superior outcome for gastric PTLD; however, a significance level was not achieved (P = 0.1; [Figure 1]. When death only due to PTLD was used as the outcome, no significant difference was observed. The one- and five-year survival rates for gastric PTLD patients were 71% and 54%, respectively, compared with 57% and 38%, respectively, for the control group. Figure 1: Survival curves of organ recipients developing post-transplant lymphoproliferative disorders within their stomach versus other localizations. We observed that none of the therapeutic strategies used was associated with a significantly better outcome. The mortality associated with each therapeutic strategy was as follows: One out of six patients (16.7%) who underwent surgical therapy died; mortality rate for rituximab therapy was similar to that for surgery. Also, six out of 13 patients (42.6%) who received chemotherapy and 33% of patients who received alfa-interferon and radiotherapy died. Most of the PTLD lesions of the GIT occur in the bowels, predominantly small bowel, and the number of reported cases of gastric involvement is extremely limited. This limited number of cases in individual as well as multi-center studies inevitably limits our knowledge on gastric PTLD. The PTLD International Survey is an attempt to gather data on the largest possible PTLD patient population to discover new perspectives on the uncommon and rarely investigated aspects of the disease. ,, To the best of our knowledge, the current study is the first to have specifically focused on various characteristics of PTLD, including morphology and clonality, EBV infection status, prognostic factors and efficacy of various treatment strategies employed. In this study, no correlation was found between PTLD arising in the gastric tissue, compared with other organs, concerning most demographic characteristics, histopathological findings, EBV infection rate and presentation time. Male gender was relatively less frequent among patients who developed gastric PTLD, but the difference was not significant. Further analysis showed that gastric PTLD had a trend toward less vulnerability for developing metastasis. When survival analysis was conducted, a trend toward better outcome was detected for gastric PTLD. This finding is in contrast to a previous study of ours that showed a low survival rate for patients who develop gastric cancer in the non-transplant population. However, the current study is on patients with PTLD, which is a different issue. Several potential explanations exist for this relatively favorable outcome among gastric PTLD patients: PTLD affecting the stomach may induce signs and symptoms in early stages of the disease, resulting in earlier diagnosis and treatment, and consequently a relatively better outcome. On the other hand, the anatomical location of the stomach as well as its natural defense mechanisms can be another reason for the observation. But, are these findings specific to gastric PTLD? Surprisingly, a previous study on small intestinal involvement of PTLD revealed findings similar to those for the current report on gastric PTLD. In that study, it was found that renal recipients who develop small intestinal PTLD had comparable demographics, and they also had a relatively better outcome and lesser metastasis than PTLD in other localizations; the difference was not statistically significant. Thus, our combined data might suggest that PTLD developing in the GIT might carry better survival than other localizations; this conclusion must be considered cautiously and warrants further studies. Additionally, different treatment strategies that were employed to manage gastric PTLD were analyzed to determine whether any specific protocol promises a significantly better outcome compared with other therapies. Judgment, based on the outcome of patients who have received different therapeutic regimens, is very controversial; it is quite logical that physicians would have decided to employ different treatment protocols for patients in different conditions. Thus, a bad outcome in patients who had received chemotherapy does not mean that chemotherapy has minimal or no favorable effect on patients' outcome. In the current study, although survival analysis showed no significant advantage for any specific therapy over others, surgery and rituximab were associated with low mortality (17%; both) while chemotherapy was associated with poorer survival rates. There are some limitations associated with our study. Our study included patients from different reports who were under treatment in different centers. This might imply that comparing data of these patients can be associated with bias. For example, the cause of mortality might not be uniformly represented in different studies. Accepting these criticisms, we re-acknowledge that in this study, we standardized data of patients before enrolling them into the analysis. We believe that this standardization has effectively made data of our study comparable. Moreover, in data such as metastasis and demographics, a center effect may not play a major role. Nevertheless, despite the limitations, we believe that our findings on gastric involvement by PTLD can be used for day-to-day practice. In conclusion, this study revealed that organ recipients presenting with gastric PTLD have a trend toward less-frequent development of metastasis, and hence might carry a relatively more favorable outcome. Prospective studies with a larger patient population are needed to confirm or modify our results. 1. Nalesnik MA, Jaffe R, Starzl TE, et al. The pathology of posttransplant lymphoproliferative disorders occurring in the setting of cyclosporine A-prednisone immunosuppression. Am J Pathol 1988;133:173-92. 2. Opelz G, Henderson R. Incidence of non-Hodgkins lymphomas in kidney and heart transplant recipients. Lancet 1993;342:1514-6. 3. Levy M, Backman L, Husberg B, et al. De novo malignancy following liver transplantation: A single-center study. Transplant Proc 1993;25: 1397-9. 4. Malatack IF, Gartner IC Ir, Urbach AH, Zitelli BI. Orthotopic liver transplantation, Epstein-Barr virus, cyclosporine, and lymphoproliferative disease: A growing concern. I Pediatr 1991;118:667-75. 5. Cox KL, Lawrence-Miyasaki LS, Garcia-Kennedy R, et al. An increased incidence of Epstein-Barr virus infection and lymphoproliferative disorder in young children on FK506 after liver transplantation. Transplantation 1995; 59:524-9. 6. Stieber AO, Boillot O, Scotti-Foglieni C, et al. The surgical implications of the posttransplant lymphoproliferative disorders. Transplant Proc 1991;23:1477-9. 7. Khedmat H, Taheri S. CD20 Antigen Expression by Lymphoproliferative Disorders after Kidney Transplant is Independently Associated with a Poor Outcome: PTLD.Int Survey. Exp Clin Transplant 2012;10325-31. 8. Allen U, Hebert D, Moore D, Dror Y, Wasfy S. Epstein-Barr virus-related post-transplant lymphoproliferative disease in solid organ transplant recipients, 1988-97: A Canadian multi-centre experience. Pediatr Transplant 2001;5:198-203. 9. Khedmat H, Taheri S. Hepatitis C virus infection can affect lymphoproliferative disorders only as a cofactor for Epstein-Barr virus in liver transplant recipients: PTLD.Int survey. Exp Clin Transplant 2012;10:141-7. 10. Nemati E, Taheri S, Pourfarziani V, Einollahi B. Cytomegalovirus disease in renal transplant recipients: An Iranian experience. Exp Clin Transplant 2008;6:132-6. 11. Newell KA, Alonso EM, Whitington PF, et al. Posttransplant lymphoproliferative disease in pediatric liver transplantation. Interplay between primary Epstein-Barr virus infection and immunosuppression. Transplantation 1996;62: 370-5. 12. Preiksaitis IK, Keay S. Diagnosis and management of post-transplant lymphoproliferative disorder in solid-organ transplant recipients. Clin Infect Dis 2001;33(Suppl l):S38-46. 13. Khedmat H, Taheri S. Heart allograft involvement by posttransplant lymphoproliferative disorders: Report from the PTLD. Int survey. Exp Clin Transplant 2011;9:258-64. 14. Izadi M, Fazel M, Saadat SH, Taheri S. Hepatic involvement by lymphoproliferative disorders post liver transplantation: PTLD.Int. Survey. Hepatol Int 2011;5:759-66. 15. Khedmat H, Taheri S. Small Intestinal Involvement by Lymphoproliferative Disorders Post Renal Transplantation: Report from the PTLD. Int. Survey. Saudi I Kidney Dis Transpl 2013; 24(3):487-94. 16. Khedmat H, Taheri S. Characteristics and prognosis of post-transplant lymphoproliferative disorders within renal allograft: Report from the PTLD.Int. Survey. Ann Transplant 2010;15:80-6. 18. Oyama T, Ichimura K, Suzuki R, et al. Senile EBV+ B-cell lymphoproliferative disorders: A clinicopathologic study of 22 patients. Am J Surg Pathol 2003;27:16-26. 19. Barker JN, Martin PL, Coad JE, et al. Low incidence of Epstein-Barr virus-associated posttransplantation lymphoproliferative disorders in 272 unrelated-donor umbilical cord blood transplant recipients. Biol Blood Marrow Transplant 2001;7:395-9. 20. Jacobson BC, Paterson JM, Carr-Locke DL. Posttransplantation lymphoproliferative disorder of the stomach. Gastrointest Endosc 2000;51: 595. 21. Lee P, Minai OA, Mehta AC, DeCamp MM, Murthy S. Pulmonary nodules in lung transplant recipients: Etiology and outcome. Chest 2004; 125:165-72. 22. Medlicott SA, Devlin S, Helmersen DS, Yilmaz A, Mansoor A. Early post-transplant smooth muscle neoplasia of the colon presenting as diminutive polyps: A case complicating post-transplant lymphoproliferative disorder. Int J Surg Pathol 2006;14:155-61. 23. Orjuela M, Gross TG, Cheung YK, Alobeid B, Morris E, Cairo MS. A pilot study of chemo-immunotherapy (cyclophosphamide, prednisone, and rituximab) in patients with post-transplant lymphoproliferative disorder following solid organ transplantation. Clin Cancer Res 2003; 9:3945-52S. 24. Hsi ED, Singleton TP, Swinnen L, Dunphy CH, Alkan S. Mucosa-associated lymphoid tissue-type lymphomas occurring in post-transplantation patients. Am J Surg Pathol 2000;24:100-6. 25. Patel H, Vogl DT, Aqui N, et al. Posttransplant lymphoproliferative disorder in adult liver transplant recipients: A report of seventeen cases. Leuk Lymphoma 2007;48:885-91. 26. Koh BY, Rosenthal P, Medeiros LJ, et al. Post-transplantation lymphoproliferative disorders in pediatric patients undergoing liver transplan­tation. Arch Pathol Lab Med 2001;125:337-43. 27. Abe T, Ichimaru N, Kokado Y, et al. Post-transplant lymphoproliferative disorder following renal transplantation: A single-center experience over 40 years. Int J Urol 2010;17:48-54. 28. Timuragaoglu A, U ur-Bilgin A, Colak D, et al. Posttransplant lymphoproliferative disorders in transplant recipients. Transplant Proc 2006;38: 641-5. 29. Soler MJ, Puig JM, Mir M, et al. Posttransplant lymphoproliferative disease: treatment and outcome in renal transplant recipients. Transplant Proc 2003;35:1709-13. 30. Peraira JR, Segovia J, Fuertes B, et al. Current induction immunosuppression and post-heart transplant lymphoproliferative disorders. Transplant Proc 2003;35:2009-10. 31. Craig FE, Gulley ML, Banks PM. Post-transplantation lymphoproliferative disorders. Am J Clin Pathol 1993;99:265-76. 32. Timms JM, Bell A, Flavell JR, et al. Target cells of Epstein-Barr virus (EBV)-positive post-transplant lymphoproliferative disease: Similarities to EBV-positive Hodgkin's lymphoma. Lancet 2003;361:217-23. 33. Sevmis S, Pehlivan S, Shabazov R, Karakayali H, Ozcay F, Haberal M. Posttransplant lymphoproliferative disease in pediatric liver transplant recipients. Transplant Proc 2009;41:2881-3. 34. Ganne V, Siddiqi N, Kamaplath B, et al. Humanized anti-CD20 monoclonal antibody (Rituximab) treatment for posttransplant lymphoproliferative disorder. Clin Transplant 2003;17: 417-22. 35. Collins MH, Montone KT, Leahey AM, et al. Post-transplant lymphoproliferative disease in children. Pediatr Transplant 2001;5:250-7. 36. Cacciarelli TV, Green M, Jaffe R, et al. Management of posttransplant lymphoproliferative disease in pediatric liver transplant recipients receiving primary tacrolimus (FK506) therapy. Transplantation 1998;66:1047-52. 37. Kerkar N, Morotti RA, Madan RP, et al. The changing face of post-transplant lymphoproliferative disease in the era of molecular EBV monitoring. Pediatr Transplant 2010;14:504-11. 38. Dusenbery D, Nalesnik MA, Locker J, Swerdlow SH. Cytologic features of post-transplant lymphoproliferative disorder. Diagn Cytopathol 1997;16:489-96. 39. Oertel S, Trappe RU, Zeidler K, et al. Epstein-Barr viral load in whole blood of adults with posttransplant lymphoproliferative disorder after solid organ transplantation does not correlate with clinical course. Ann Hematol 2006;85:478-84. 40. Davis JE, Sherritt MA, Bharadwaj M, et al. Determining virological, serological and immunological parameters of EBV infection in the development of PTLD. Int Immunol 2004; 16: 983-9. 41. Bakker NA, Van Imhoff GW, Verschuuren EA, et al. Early onset post-transplant lymphoproliferative disease is associated with allograft localization. Clin Transplant 2005;19:327-34. 42. Herzig KA, Juffs HG, Norris D, et al. A single-centre experience of post-renal transplant lymphoproliferative disorder. Transpl Int 2003;167: 529-36. 43. Muti G, Cantoni S, Oreste P, et al. Post-transplant lympoproliferative disorders: Improved outcome after clinico-pathologically tailored treatment. Haematologica 2002;87:67-77. 44. Chen PL, Chang HH, Chen IM, et al. Malignancy after heart transplantation. J Chin Med Assoc 2009;72:588-93. 45. Wilde GE, Moore DJ, Bellah RD. Posttransplantation lymphoproliferative disorder in pediatric recipients of solid organ transplants: Timing and location of disease. AJR Am J Roentgenol 2005;185:1335-41. 46. Lucioni M, Ippoliti G, Campana C, et al. EBV positive primary cutaneous CD30+ large T-cell lymphoma in a heart transplanted patient: Case report. Am J Transplant 2004;4:1915-20. 47. Jain A, Nalesnik M, Reyes J, et al. Post-transplant lymphoproliferative disorders in liver transplantation: A 20-year experience. Ann Surg 2002;236:429-36. 48. Paraskevas S, Coad JE, Gruessner A, et al. Posttransplant Lymphoproliferative Disorder in Pancreas Transplantation: A Single-Center Experience. Transplantation 2005;80:613-22. 49. Hachem RR, Chakinala MM, Yusen RD, et al. Abdominal-pelvic lymphoproliferative disease after lung transplantation: Presentation and outcome. Transplantation 2004;77:431-7. 50. Smets F, Vajro P, Cornu G, Reding R, Otte JB, Sokal E. Indications and results of chemotherapy in children with post-transplant lymphoproliferative disease after liver transplantation. Transplantation 2000;69:982-5. 51. Hanasono MM, Parrett BM, Breitbart AS. Post-transplant lymphoproliferative disorder presenting as a cutaneous forehead mass. Otolaryngol Head Neck Surg 2004;130:372-4. 52. Pourfarziani V, Taheri S, Lessan-Pezeshki M, et al. Lymphoma after living donor kidney transplantation: An Iranian multicenter experience. Int Urol Nephrol 2008;40:1089-94. 53. Mamzer-Bruneel MF, Bourquelot P, Hermine O, Legendre C, Kreis H. Treatment and prognosis of post-transplant lymphoproliferative disease. Ann Transplant 1997;2:42-8. 54. Pascual J. Posttransplant lymphoproliferative disorder-the potential of proliferation signal inhibitors. Nephrol Dial Transplant 2007;22 Suppl l:i27-35. 55. Montanari F, O'Connor OA, Savage DG, et al. Bone marrow involvement in patients with posttransplant lymphoproliferative disorders: Incidence and prognostic factors. Hum Pathol 2010;41:1150-8. 56. Webber SA, Naftel DC, Fricker FJ, et al. Lymphoproliferative disorders after paediatric heart transplantation: A multi-institutional study. Pediatric Heart Transplant Study. Lancet 2006;367:233-9. 57. Wu JF, Ho MC, Ni YH, et al. Timing of Epstein-Barr virus acquisition and the course of posttransplantation lymphoproliferative disorder in children. Transplantation 2009;87:758-62. 58. Burra P, Buda A, Livi U, et al. Occurrence of post-transplant lymphoproliferative disorders among over thousand adult recipients: Any role for hepatitis C infection? Eur J Gastroenterol Hepatol 2006;18:1065-70. 59. Praghakaran K, Wise B, Chen A, Schwarz K, Colombani P. Rational management of post-transplant lymphoproliferative disorder in pediatric recipients. J Pediatr Surg 1999;34:112-5. 60. Izadi M, Taheri S. Significance of in situ hybriddization results for EBV-encoded RNA in post-transplantation lymphoproliferative disorder setting: Report from the PTLD.Int Survey. Ann Transplant 2010;15:102-9. 61. Khedmat H, Taheri S. Post-Transplantation Lymphoproliferative disorders localizing in the adenotonsillar region: Report from the PTLD. Int survey. Ann Transplant 2011;16:109-16. 62. Khedmat H, Taheri S. Early versus late outset of lymphoproliferative disorders post-heart and lung transplantation: The PTLD.Int Survey. Hematol Oncol Stem Cell Ther 2011;4:10-6. 63. 63. Khedmat H, Panahian M, Mashahdian M, Rajabpour MV, Zendehdel K. Prognostic factors and survival in stomach cancer - analysis of 15 years of data from a referral hospital in Iran and evaluation of international variation. Onkologie 2011;34:178-82.